Radio SEGA’s latest smash hit pits the teams of AAUK and Jay Zeach against Roareye Black and Vger whilst Fastfeet is your debonair chairperson. Each team has a different guest panellist every week – this show is unleashed and certainly not for kids! 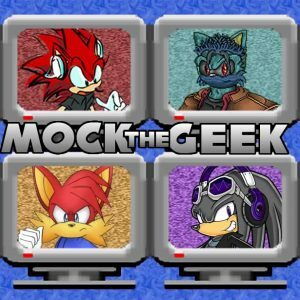 The first episode of Mock the Geek took place as part of the SEGA Media Special, where after a slow start it really goes up the gears in the second round and gives you a good taste of future episodes. Let comedy commence! Owing to technical issues we’re missing the first half of this show. SEGA Media’s explicit panel show returns for it’s second show this week, with this week’s guests including SW’s own TallGuy. On this week’s show: Things Robotnik says when he’s alone, something terrible happens to Cream, Owl raps, the Sonic Boom event signals the start of shocking action and Silver’s horrifying new move is revealed. Another week, another mocking! Join us for more comedy from the last weeks SEGA and Sonic news plus a range of beat boxing too! Guests this week are Speedknux and Urtheart with SJ filling in for Roareye Black. After our first break we return with an Xtended show! Along with the mother of all beat box battles the quiz covers drunken Sonic fans and E3 calamities… an unmissable episode! We take some more mocking with episode 5, and with it comes E3 questions and rounds! FastFeet is joined by regulars and guests Ryo-no-Kage and Spinic. (NB: The connection to Fastfeet’s rather bad on occasion in this episode and it is included more for completion). There’s only one more week until Summer of Sonic, so you know what that means – a pre-SoS show! FastFeet and the regulars are joined by guests SJ and Ein Eagle Vanato, talking SEGA hacks, Sonic Generations and modern-era beat boxing!